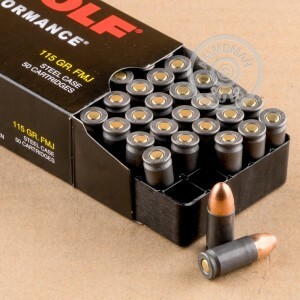 Grab this case of 500 rounds of Wolf 9mm Luger ammo to get the range time you want at a price that won't spoil your fun or annoy your wife. These rounds use a light 115 grain bimetal jacketed bullet, non-corrosive Berdan primers, and polymer coated steel cases for enhanced feeding and ejection. Although quite reliable and economical, the steel casings cannot be reloaded. 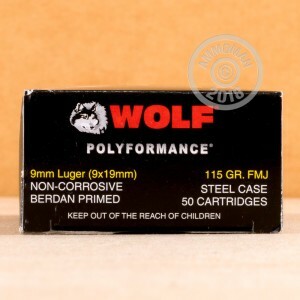 Wolf ammo is made in Russia, where ammo factories have been churning out steel-cased ammo since the 1920s. 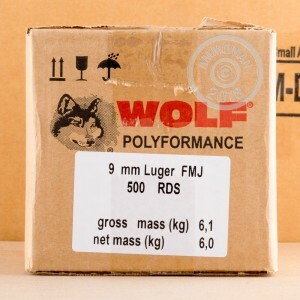 Recent advances in polymer coatings have led to the Wolf Polyformance line, which boasts enhanced performance at the same great prices. This standard pressure load will work in virtually all 9mm Parabellum pistols from the pocket-sized XDS and P938 to the full-size P226 and Hi Power. Get this case, or any other items totaling $99 or more, to take advantage of AmmoMan.com's free shipping rule for bulk orders. Great ammo I have fired 400 rounds so far and have not had any issues in my Glock 17. My only complaint is it has lots of residue, but worth the money for range time or stocking up. My Sig p938 went thru 50 rounds today without any issues! Good value! Very happy, ammo fire great. Very quick delivery. Quality packaging and shoots great. Only gone through about 200 rds so far, but all working fine. 5 fail to ignite in first 100. Junk, too bad, a few years ago I had no problem using Wolf in local matches. Although there were no dead rounds and the ammo is priced right. I would never purchase metal cased ammo again. This is only my opinion. Also I would not ammo any place else, but from the Ammoman. This is the only place to buy your bulg ammo. Shot 500+ rounds for a class in one day. No bad rounds. No issues. I would definitely recommend theses and you just can't beat the service and speedy shipping you get from these folks. I ordered two 500 round quantities of this ammo. So far I have shot around 400 rounds out of the 1000 out of a Glock 23 with a 40-9 Lonewolf barrel. The first 50 or so ran well with minor issues with having a 5 to 6 o'clock ejection pattern. After that my Glock was jammed shut. I had to disassemble the gun, hammer the barrel out of the gun, and push the round out with a cleaning rod. The primer had been struck, but the round did not fire. The next day I went out and shot another 100 or so rounds only for this to happen to me about five more times all of which happened the exact same way. For me to have to hammer the barrel out makes this not worth the trouble for me. It would be different if I could just tap, rack, and shoot again, but the slide jams up every time this happens. You get what you pay for I guess. Just got my first 500 box today and already gone through half of it. Shoots nice seems to be decent ammo and pretty good price. Actually cheaper for me than going to the local store. So i'll be buying myself another case of this stuff. No FTF or FTE while using ammo to break in a new S&W MP Shield. Just doesn't make sense to buy shinny brass ammo for more money and no true visible benefit. Just like some people pay more to get high test premium gas, I won't and I will continue to buy this ammo for sport shooting and I will order from Ammoman again. Good value! I've shot about 1000 rounds of these out of my Smith and Wesson sd9 and I haven't had one single issue with these rounds great for plinking and for stock piling.